With its distinctive white and silver design, the Sony VAIO VGN-C2M/W (£591 inc. VAT) immediately stands out from the crowd. Delivering high performance and strong usability, there's plenty to like about this stylish laptop. Weighing 2.3kg, it's quite light and makes for a comfortable travel partner. This combines with an impressive battery life of 233 minutes. The keyboard spans the width of the chassis and is near flawless to use. All the keys are large and well mounted, with a smooth and comfortable typing action. Predictably, the white keys can quickly get dirty, but they're easily cleaned. A particular strength is the 13.3-inch screen. With a glossy Super-TFT coating, colours are natural, but reflections are increased. Images are sharp and ideal for office work as much as multimedia use. Although not the best in its class, performance is strong. Dual-core power is provided by an Intel Core 2 Duo processor, and all our test software ran with ease. Whether used at home or in the office, performance proved reliable. Graphics are provided by the integrated Intel chip, so 3D power is much lower. Simple games such as solitaire and chess can be played with ease, but don't expect to use this as a full gaming system. Regardless, multimedia tasks such as video editing still run capably. While the 100GB hard drive provides ample storage, it spins at a slower speed than many rivals. As a result, data is accessed slightly slower, but not hugely so. A dual-layer rewritable DVD drive also lets you save up to 8.5GB of data per disc. Although none of the laptops at this price offer great connectivity, the VAIO is something of a mixed bag. While it offers Firewire compatibility for external devices, only two USB ports are provided, limiting the number of peripherals you can connect. However, it does include Bluetooth technology, allowing devices to be connected wirelessly. 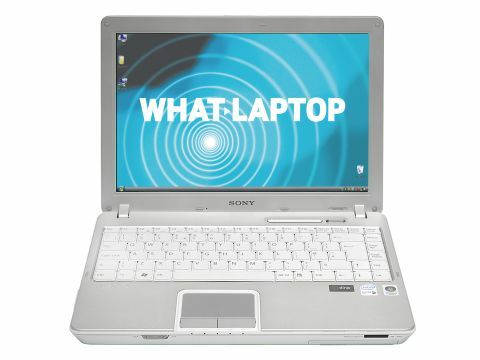 A common feature of Sony laptops is a comprehensive package of software, and this is no exception. Market-leading tools for home office tasks, digital photo editing and internet security are all included. However, you'll need to add your own CD/DVD creation software. With its combination of mobility, high performance and strong usability, the Sony VAIO VGN-C2M/W is a great budget portable. It would be easy to expect it to cost quite a bit more than its sub-£599 price tag, so it's a real bargain.